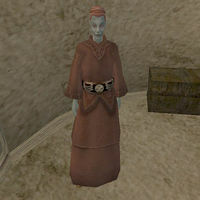 Sedris Omalen is a Dunmer priestess who serves at the Outpost in Maar Gan. There she sells ingredients, potions, spells, and spellmaking services to all who need them. Sedris is a restocking vendor for the following ingredients: Alit Hide, Black Lichen, Corkbulb Root, Hackle-Lo Leaf, and Saltrice.